A hotly debated cybersecurity bill passed the House Thursday afternoon, garnering bipartisan support despite a White House veto threat. The Cyber Intelligence Sharing and Protection Act (CISPA) was passed 288 to 127. Ninety-two Democrats ignored the White House’s veto threat and voted in favor of CISPA. The bill would enable the government and private companies to partner and share information in order to actively ward off foreign and domestic cyber attacks. Forty-two Democrats supported a version of CISPA that passed the House last year before failing to pass the Senate. Sources on Capitol Hill say the increased Democratic support is evidence the White House is losing its bid to stymie the legislation, which military leaders and other experts have said is vital to America’s efforts to fight enemy hackers. "I think the White House needs to learn how to play well with others," a congressional staffer who has been working on the legislation said following the vote. The Obama administration had been working closely with both Democrats and Republicans on the House Intelligence Committee, which finalized the bill earlier this week. However, the White House left the bargaining table after the committee failed to agree to certain concessions, sources said. The CISPA vote comes just a day after the White House was dealt a major blow with the defeat of gun legislation in the Senate. CISPA would allow the government to pass on secret information about cyber threats to private companies. These companies would also be granted the ability to share information about customers with the government if there are national security implications. The White House and privacy advocates argue the bill does not go far enough to protect American citizens from having their private details exposed to the government. The Obama administration said in a statement earlier this week that it "remains concerned that the bill does not require private entities to take reasonable steps to remove irrelevant personal information when sending cybersecurity data to the government or other private sector entities." "Citizens have a right to know that corporations will be held accountable—and not granted immunity—for failing to safeguard personal information adequately," the statement said. However, lawmakers on both sides of the aisle went to great lengths to amend the legislation to address such concerns. 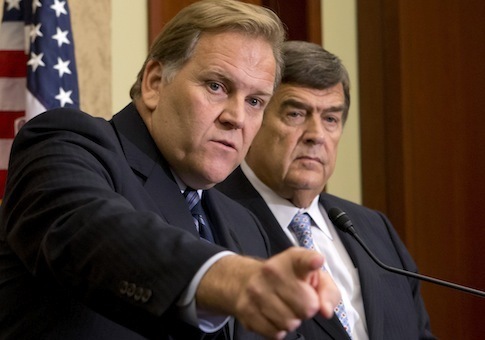 House Intelligence Committee chairman Mike Rogers (R., Mich.) and the committee’s top Democrat, Rep. Dutch Ruppersberger (Md. ), both worked to address the White House’s concerns before the administration bailed on the bill. CISPA marks a chance "to take a shot across China's bow," Rogers was quoted as saying prior to the vote. Chinese hackers, among other nations, "bombard" the Pentagon’s computer systems "by the millions each and every day," yet the United States has no way to fight back, former Attorney General Michael Mukasey recently warned. Privacy advocates who are trying to kill the legislation are inflating concerns in order to scare the public, Rogers said. "This protects privacy, it protects civil liberty," Rogers said. "This is the answer to empower cyber information sharing." Both Rogers and Ruppersberger expressed optimism about the prospects for full passage following the House vote. "I am very proud that so many of my colleagues were able to look past the distortions and fear mongering about this bill and see it for what it really is—a very narrow and focused authority to share cybersecurity threat information to keep America safe," Rogers said in a statement following the vote. "I look forward to working with my Senate colleagues to get cyber threat information sharing legislation passed into law this year." Rep. Ruppersberger said the House made the right choice in backing the bill. "Passing this legislation is not just a victory on the House floor. This is victory for America," Ruppersberger said in a statement. "Our nation is one step closer to making a real difference protecting our country from a catastrophic cyber attack." This entry was posted in National Security and tagged C.A. Dutch Ruppersberger, Congress, Cyber Security, Mike Rogers. Bookmark the permalink.